Apple has just officially unveiled not just one, but two new iPhones in one of the most prestigious product launches in its history. 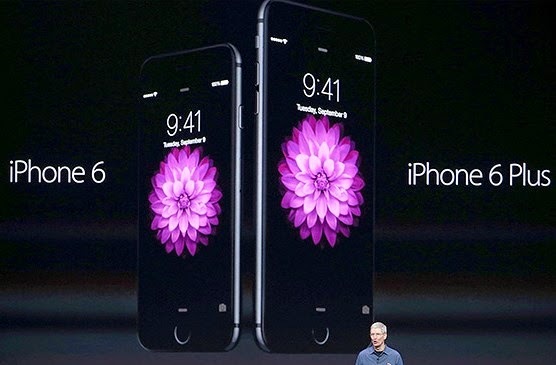 Introducing Apple's newest, bigger, rounder, and faster iPhone 6, and the iPhone 6 Plus! What's the difference the two iPhones? Read on to find out more. "Today, we are launching the biggest advancement in the history of iPhone. They are without a doubt the best iPhones we've ever done,"Apple CEO Tim Cook said in an event in Cupertino, California on Tuesday. As officially introduced, the new iPhones have curved edges and bigger screens, measuring 4.7 inches and 5.5 inches (4-inch) bigger than the iPhone 5S. While these new iPhones do come in bigger sizes, Apple also makes sure they will be easier for users to handle. And you asked how? Well, Apple has purposely moved the on-off switch to the right edge of the device. With a double-tap on the Home button, the whole display will slide down, allowing users to easily access items on top of the screen. And how about the battery life? Well, this could be one of the common questions asked. In respond, these bigger displays allow for bigger batteries, in fact, battery life of the new iPhones is 10 hours higher than that of the iPhone 5S. On the iPhone 6, you can have 11 hours of video streaming and 14 hours on the iPhone 6 Plus. Apple's newest iPhones integrate the company's new A8 processor. That being said, these new devices are 25 percent faster that the iPhone 5S. The new iPhone 6 also sports the M8 co-processor, enabling fitness applications to tell variations between walking and biking, and even measuring the user's relative elevation. According to Apple, the 8 megapixel camera on its iPhone 6 and iPhone 6 Plus will come with a new sensor for faster camera focus. Overall, it's highly expected to be a high-quality camera for high-quality film-making outputs. According to Phil Schiller of Apple, on Tuesday's product announcement, the iPhone 6 offers camera features with "technology used by high-end DSLRs” coupled with the capacity to capture 1080p high-definition clips at 60 frames per second, could take 240-fps slow-motion shots, provides cinematic video stabilization, and offer up to 128 GB of storage. As expected, the new iPhones will come with Apple's newest iOS 8 software, with a number of essential pre-installed apps including a new HealthKit app for heart rates, sleep, weight and blood pressure monitoring. Apple's new iOS 8 is expected to be rolled out to customers who have iPhone 4S, iPhone 5, iPhone 5c and iPhone 5s, on September 17th. Meanwhile, both the iPhone 6 and the iPhone 6 Plus will be available in the United States and 8 other countries, on September 19th. Pre-orders will start on Friday. Interested buyers can get the 16GB iPhone 6 for a cost of $199, the 64GB version for $299, and the 128Gb model for $399. Initial pricing for the iPhone 6 Plus will be at $299. Discounts will also be applied to Apple's iPhone 5s and iPhone 5c by $100. And to put an end to speculations on the iPhone 5C's plastic treatment, Apple has clarified the iPhone 5S will maintain its aluminum casing.